GarageSale for iPhone and iPad offers all the features you need to get your stuff onto eBay. Create and list awesome listings and keep track of them - wherever you are. Store up to 20 images per listing free of charge on our servers and say 'Goodbye' to eBay's image hosting fees. Activate GarageSale's Image Server option in the preferences. The quality and number of your auctions pictures is crucial for the success of your auction. With GarageSale you can store up to 5 auction images for regular auctions on our servers without paying image hosting fees to eBay. (So far store items and 'Good till canceled' auctions are not supported.) 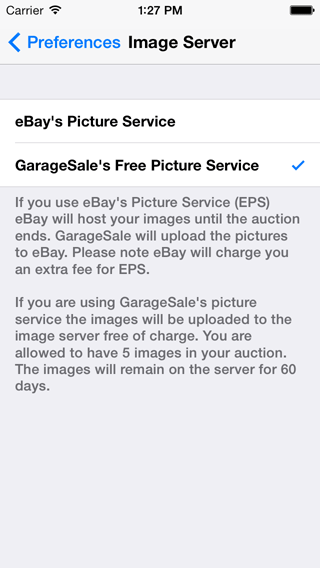 Of course you can also use eBay's Picture Service (EPS) for image hosting. Beef up your auctions with one of GarageSale's legendary auction designs for free. GarageSale for iPhone and iPad includes 12 free auction designs. You can preview your auction before uploading it to eBay. GarageSale offers an integrated design store that lets you buy additional auction designs from within the application. To open the design store just click "Buy More" in the preview section. There is no limit on how often you can use a purchased design. Once you purchased a design, you can use it as often as you want to. 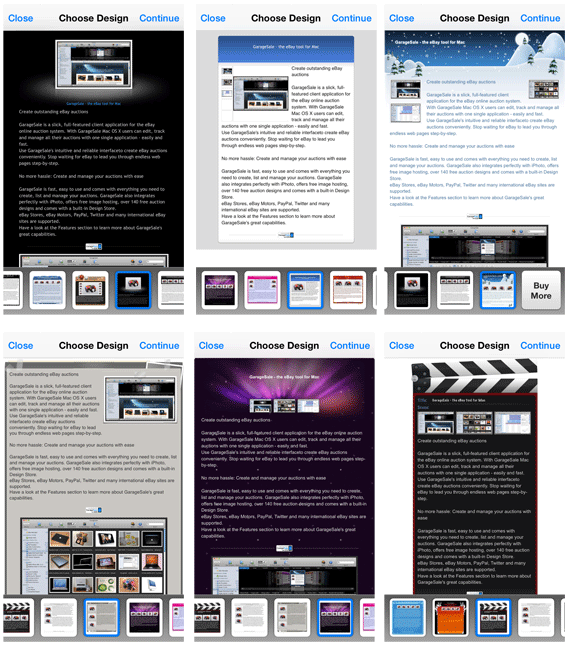 Import auctions created on your iPhone into GarageSale 6 for Mac using Bonjour Sharing. This also allows you to repare auctions on the go and save them for later refinement or upload. For more instructions how to use this feature have a look at the FAQ-section > 'How does the sharing feature work?'. Please note that the sharing feature is not compatible with the new GarageSale 7 for Mac, only with the older version GarageSale 6. Add existing images to your auction or take new snapshots directly from within GarageSale Touch. If you own a DropBox account you can grab your images from there and import it into your auction. 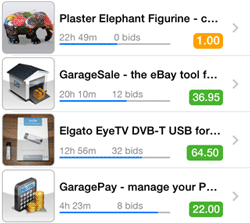 GarageSale retrieves and displays real-time fee information from eBay before starting an auction. GarageSale supports eBay's auction scheduler, letting you submit an auction to eBay before its actual start time. You can use your eBay Store with GarageSale Touch, too. 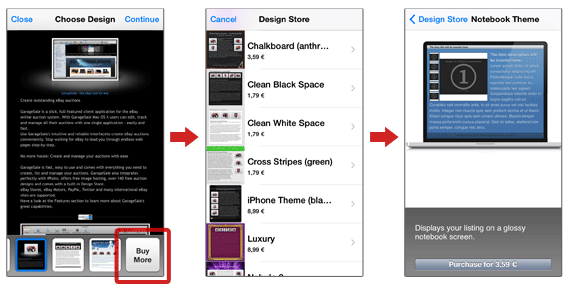 Just download your store categories in the preferences. You can then select them in the listing settings. GarageSale Touch allows you to revise or relist your auctions you originally started with GarageSale on your device. To do so click the 'Revise' button in the auction detail view. You have to to enable 'Keep prepared auctions' in the GarageSale preferences to make this function work! 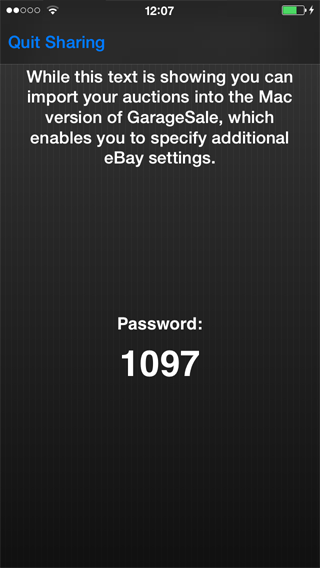 Optionally protect your eBay account with a password, so nobody else can start auctions using your iPhone. 20 different eBay sites are supported, including eBay.com, eBay Motors US, eBay.ca, eBay.co.uk and eBay.de. Happy listing all around the world! GarageSale supports SmileOnMyMac's TextExpander app. It allows you to easily insert often used text snippets (shipping terms, payment instructions, etc.) into your auction description: "With TextExpander touch, you can type faster on your iPhone or iPod touch using short abbreviations that expand into long snippets." GarageSale automatically downloads category and attribute data updates from eBay as they are released.